5 Objectives/Pitched Battle. Sisters commanded by Grumblebunny. SM led by Henshini. Space Marine frontline; compact and centered on the table edge. The Sisters have each flank protected by a squad of dismounted infantry while their transports and Immolaters take up the center opposite the SMs. The sisters push forward. The fast-moving (and raging) Repentia close on a rather surprised Land Speeder. I wonder how this meeting will end up? The left-flank dismounted Sisters grind down the approaching combat squad over a couple of rounds. The Ironclad attempts to flame the approaching raging Repentia after the approaching golden Rhinos pop smoke. Eviscerators make short work of the Ironclad. However, the Space Marine battleline holds strong. The Terminator Librarian teleports his squad across the board arriving behind the Sister's battleline. The dismounted sisters attempt to melta the smoke covered Rhino and Multi-melta the Vindicator. The Sisters take their toll on the teleporting Termies. Having popped the Sisters rides' the SM honour guard close on the dismounted Sisters. The termies and outflanking scouts slow grind down the sisters on the hill top. 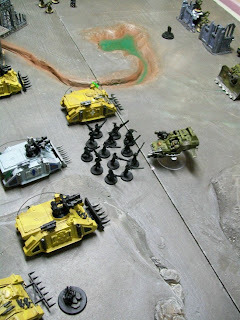 Having cleared the dismounted Sisters from the central objective, the honour guard and tac squad look to clear out the remaining Sisters threatening their brethren. The damage has been done. SMs with 2 objectives, 1 contested, 1 unclaimed and 1 to the Sisters.